Their videos regularly appear on YouTube channels with names like “MrInfo2Go” or “Young & Naïve” and reach millions of young Germans. Yet these vloggers are not talking about music, gaming, or lifestyles; they are into politics. It is summer 2015, and in Germany the refugee crisis is the central topic of political and social debate. Chancellor Angela Merkel is not having an easy time of it. So she decides to grant her very first interview to a successful YouTuber. Vlogger LeFloid is nothing like the renowned political journalists that usually surround the chancellor. So the hailstorm of criticism that follows the interview broadcast in July 2015 is not really a surprise, as viewers call him out on the softball questions and his conciliatory interview style. LeFloid is not a trained political journalist, and this is not the first time he has been accused of spreading information without seeming to reflect on it first. This has done nothing to dim his popularity among young users though. The YouTube coup garnered over five millions views – more than any other interview broadcast over the public television stations that summer. Berlin native Florian Mundt is the man behind the user name LeFloid. The teacher and psychologist is a YouTube star, even though he doesn’t vlog about the usual things like music, gaming and lifestyle issues. LeFloid creates ten-minute videos about politics for LeNews, a political one-man show he started in 2007. He talks about current events and his animated body language and blunt, uncouth expressions with poetry slam flair make for lively viewing. 3.1 million subscribers regularly watch his vlog and have generated almost 630 million views so far, making his one of the most subscribed YouTube channels in Germany. And his is not the only YouTuber out there discussing politics. Some channels have disappeared just as quickly as they appeared, but many others have a young, loyal band of followers driving up views and subscriptions. According to the latest JIM Study, an annual report on youth, information, and (multi-) media released by the Medienpädagogische Forschungsverbund Südwest, a research group that looks into educational media, YouTube remains “indisputably the most important platform for moving images for young people.” 88 percent of youths between the ages of 12 to 19 reported using YouTube multiple times a week, and 63 percent accessed the platform daily. Around one-third of this age group said they watched videos on current events. Unlike fellow YouTuber LeFloid, Drotschmann goes a bit deeper when selecting his content than the pool of that day’s headlines. In his videos he tries to answer questions like: “What would happen if war broke out in Germany?” and “Who is Vladimir Putin?” Most feature him in front of a white background that displays numbers and pictures on topic at hand kind of like a school white board. He takes an analytical approach, breaking down complicated issues using well-founded facts in around ten minutes. His videos are more serious than LeFloid’s, but also quite popular with his over 720,000 followers who average between 19 to 21 years of age. 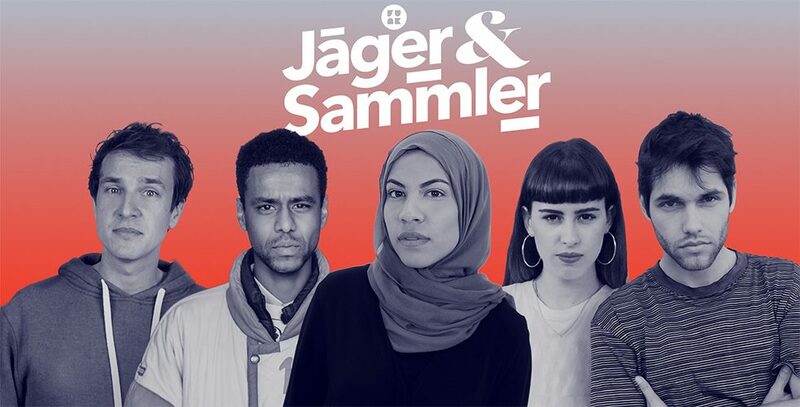 German public broadcasters created funk to offer young users around 60 internet channels, including political formats like “Jäger&Sammler” (Hunters & Gatherers). | Photo (detail): © funk/ UFA LAB/ Annemarie Thiede, Felix Meinhardt, Ole Elfenkämper, Robert Ackermann, Janick Zebrowski. Unlike the funk-supported YouTubers, Tilo Jung is a bit of a lone wolf. A classically trained journalist, he refers to himself as a “freelance editor-in-chief” and feels his complete independence from the large broadcasters gives him more freedom to choose what to cover. 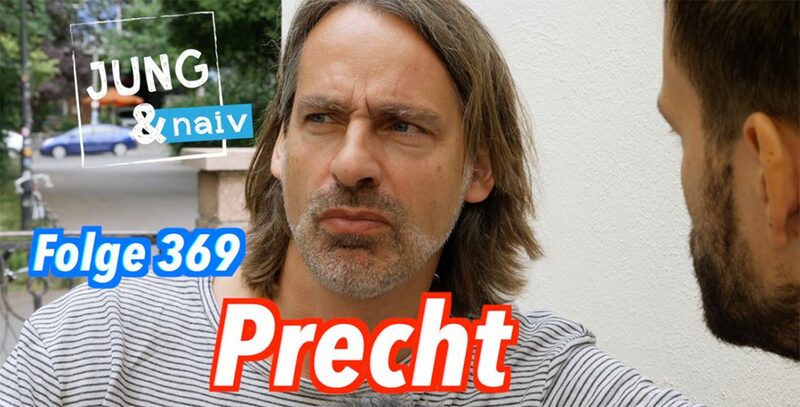 His channel is a play on his name, Jung & Naiv – Politik für Desinteressierte (Young&Naïve – Politics for the Disinterested) , and funded exclusively by sponsors. His choice of formats also sets him apart from other political YouTubers: he broadcasts uncut interviews that can run anywhere from one to two hours, much longer than the typical YouTube video. His Bundesregierung für Desinteressierte (The German Government for the Disinterested) series features hour-long, full-length government press conferences where Jung asks questions as a member of the press corps. But the number of subscribers has proven him right, as has the number of prominent interviewees. At the start of 2018, over 350 interviews were available online in which Jung talks to almost everyone who is anyone is public political life in Germany. He adopts the role of cheeky interviewer who asks deliberately stupid questions and has been known to pester his interviewees at times, and his viewers love him for it.